A durable ergonomic task stool for workshops, assembly lines, factories, schools, supermarkets, and private homes. Responsive 360° free-float saddle movement with anatomic saddle seat is suitable for both men and women. A durable heavy-duty ergonomic task stool for workshops, assembly lines, factories, schools, and supermarkets. 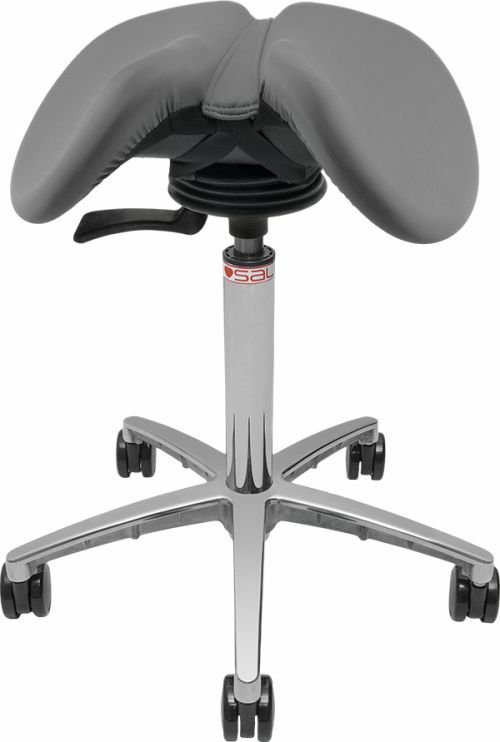 Features easy-to-clean self-skinned polyurethane seat pads. Anatomic saddle shape with a groove down the center relieves tailbone and genital pressures for cool comfort. NOTE: The polyurethane molded seat is very firm compared to upholstered Salli Saddle Chairs. Some would say uncomfortably firm. People with athletic and toned gluteal muscles will find the seat quite comfortable. For those with soft bottoms, we recommend an upholstered model with foam padding. Molded polyurethane saddle seat with an anatomic groove in the center for cool and healthy sitting. Large 65mm casters for easy maneuverability on wood and tile floors.